There are a lot of good DACs around, but few of them really stand out on technical grounds. Just recently, a few have appeared which support high-sampling-rate USB operation (previously limited to 48kHz) and that's obviously a good thing. M2Tech, however, has upped the ante by introducing a feature that was previously the sole preserve of some rare and expensive ultra-high-end kit, in the shape of 384kHz sampling. Yes, that's eight times 48kHz (and yes, eight times 44.1kHz, or 352.8kHz, is supported too). This means that a full three octaves of frequency response is now, in principle, available above CD's regular 20kHz limit. No one is suggesting we can hear as high as 160kHz, but ever since the dawn of digital audio there have been voices arguing that that much bandwidth headroom, if one can call it that, is necessary to reproduce sound in its full glory to the full satisfaction of a critical human ear. What's more, 32-bit resolution is supported. CD, of course, uses 16-bit to give resolution of one part in 65,536, or just under 100dB signal-to-noise ratio (SNR) in more familiar audio terms. 32-bit increases that by a factor of 65,536, giving a theoretical SNR of about 194dB. That's a completely unrealisable figure in practice, equivalent to about 100 microvolts of noise on the national grid 400kV supply network, but it does, at least, mean that the digital part of the system is not a limiting factor in any sense. Noise in a 32-bit system is down to good old analogue sources. One slight drawback with a product like this is the availability of software to play through it that will really tax it. If you search the internet you'll find plenty of high-res material, but it's mostly only 96kHz, 24-bit stuff. Even 192kHz sampling is hard to find and either 384kHz or 32-bit, never mind both together, is basically unavailable. What's more, at typical UK internet connection speeds you'd have to leave a download running all night to get a couple of hours' material. 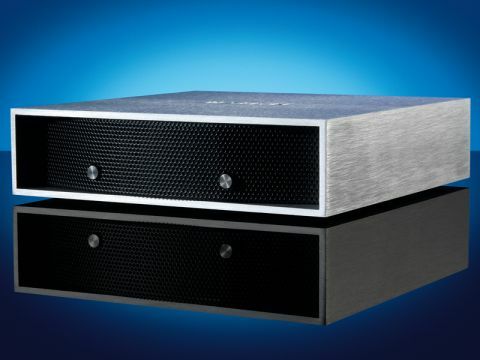 Future-proofing is a great thing, though, and indeed we're delighted to see a bit of forward-thinking in practice as it can only help to kick-start ultra-high-res recording and replay as an everyday reality rather than audiophile pipe dreams. In the mean time, it's good to know that more mundane digital standards are also catered for. If one can call 24-bit/192kHz 'mundane'. You might expect some deeply arcane technology inside such a DAC, but M2Tech has employed some surprisingly familiar parts. The allimportant DAC chip is one we've seen before in a few products and although it's usually used with its own digital filter, it can also be fed a signal via a different route, bypassing internal filters and increasing the maximum sampling rate. In fact, a handful of chips offer this possibility and we first saw it employed in the Cambridge Audio Azur 840C CD player, which rather impressively has 384kHz upsampling built-in. As with the 840C, M2Tech has built a custom oversampling filter, implemented here on a large gate array chip. That, in fact, is the fanciest part of the Young DAC's internal technology and in day-to-day terms the part that most clearly marks it out from the competition. Digital filters are only now coming to be appreciated as defining components within digital-to-analogue conversion circuits, but they can make quite a difference. This one has a 'minimum phase' response, which lacks the pre-ringing of more conventional 'linear phase' filters. For the rest, analogue circuits use familiar high-performance op-amp chips and good-quality passive components, while the power supply is an external unit. Digital inputs include one of each kind, while analogue output is unbalanced only. The front panel display is unusual but tells you what you need to know. Lacking native 384kHz source material and conscious that few users would even have access to 192kHz recordings (we had a few in-house ones to call on), we did most of our listening to the Young at 44.1 and 96kHz sampling rates, via both S/PDIF and USB. It's worth mentioning at the outset that we didn't reckon we could reliably tell a difference between the two: USB did sound worse fed from a desktop PC, but that's probably a conducted interference issue as a small laptop gave results practically indistinguishable from S/PDIF. Our comments, therefore, can be taken as representative of the DAC rather than of its connection mode. The first thing to make clear is that the sound is certainly of high-end breeding. We would have been most disappointed had it lacked anything significant in terms of resolution or neutrality and, indeed, it scored highly for both of those. It's actually exceptionally revealing and brought out details we had forgotten about in some of our own recordings – things we remembered from the recording session but hadn't heard in a while via more prosaic replay equipment. At least, we'd probably heard them, but not been made aware of them. It's a subtle difference but in some ways it's a nutshell definition of high end: little details don't just exist, they practically reach out and tap you on the shoulder. If there were nothing but little details the sound could soon become tiresomely fussy, but here they are kept in context as part of a structured, cohesive whole. A concrete example may help illustrate this. One recording we've used a few times with high-res kit is of two voices and piano, a technically fine minimalist recording which sadly we can't recommend as it never got issued commercially. At one point the singers change places in front of the piano, one moving forward and to the right as the other joins in. On most systems this is audible if one listens out for it, but just occasionally a system will show it up sufficiently clearly that it really captures the attention, as was in fact intended at the time. With excellent amps and speakers in its train, the M2Tech DAC had no trouble at all pointing up this little bit of choreography, but at the same time kept the piano stable and the tonal nature of each voice unaltered. Familiar commercial recordings were similarly flattered, with insights popping up in all sorts of unlikely places. Hearing a recording completely afresh might be slightly overstating it, but things like appreciating a subtle change in a vocalist's inflection, or a slightly different sound from a drummer, can add new meaning and interest to a well-loved track. If we have any criticism, it's of the very low bass. Now and then, in recordings which really plumb the depths, we were convinced we missed just a little clarity of pitch in the bass. There's plenty of impact, and extension, as such, is pretty much peerless, but tuned low frequencies (church organ, upright bass, orchestral timpani and so on) don't always quite seem as certain of their tuning as can sometimes be the case. That's quite a minor point, though, and we have found over the years that getting extension, attack, and tuning in the bass all just so is one of the hardest tricks in audio – one largely confined to equipment in the high reaches of the high end. There's also something of an irony in the treble, which is beautifully pure and open, even with CD-format source material. That could somewhat undermine the case for high sampling rates, were it not for the fact that at 96kHz and upward it gets even better. We'll close by suggesting a shorter term use for the 384kHz sampling capability. Having set that up, it's possible to implement customised upsampling on a home computer, getting one more (small) step up with 'standard' digital source recordings. Treat computer-based upsampling with caution as some of it is frankly dodgy, but our experiment with the upsampling provided within Izotope products (by consent of most users, just about the best upsampling on the planet, and flexible in operation, too) suggested that this is a worthwhile tweak. This isn't the first 384kHz DAC, though it's the first affordable one. It won't be the last, either. But kudos to M2Tech for doing it and huge respect and admiration for doing it so well.